How difficult are the trails? While most of our trails are very easy, we have trails to accommodate all levels of difficulty. There is very little elevation change on the visitor center side of the creek making that side of the sanctuary well suited to hikers looking for a leisurely walk. Across the bridge, hillsides provide opportunities for hikers seeking more of a challenge. The Overhill Trail (18 on the map above) leads hikers to the highest point in the sanctuary then drops down several switchbacks to reach the wetlands down below. All our trails have only natural surfacing. A short section of the Little Owl Village Trail is covered in gravel where the trail passes through a boggy area. Are any trails wheelchair accessible? Unfortunately, no. 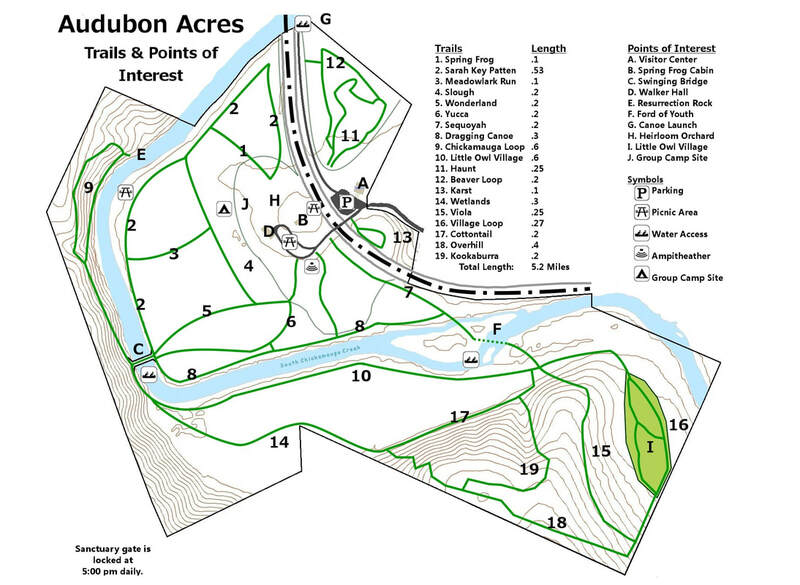 However, providing a wheelchair accessible trail at Audubon Acres is a high priority for us. If you or someone you know would like to make a contribution to help make that goal a reality, please contact us. Are the trails stroller friendly? Running strollers with large wheels would do well on the Wonderland & Yucca Trails (trails 5 & 6 on the map above). For most of the trails, however, a backpack or carrier for your child would be better suited. Because most of our trails run through the loose sandy soil of the floodplain around South Chickamauga Creek, bicycles are not a good fit for our trails and are not allowed in the sanctuary. Enterprise South Nature Park would be a better destination for cyclists. How far is the swinging bridge? The swinging bridge over the creek is roughly 1/4 mile from the Audubon Acres visitor center. A round trip would be about 1/2 a mile. How far is Little Owl's Village? Little Owl's Village is just under a mile from the Audubon Acres visitor center. A round trip would be about 2 miles. Is the swinging bridge the only place to cross the creek? If you want to keep your feet dry, then yes. You are welcome to use the shortcut through the Ford of Youth (F on the map above), however this is typically a knee deep crossing during the summer (and deeper & just plain cold during the winter). The creek bed here is very rocky. Good water shoes (like Tevas, Keens, or Chacos) will make your crossing much more enjoyable.